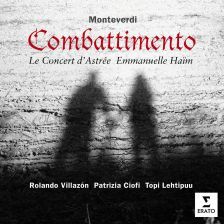 Gramophone: Monteverdi’s Combattimento – which recording should you buy? 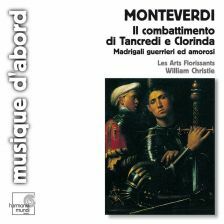 Dramatic madrigal, scena, musico-literary fling – however you care to classify Monteverdi’sCombattimento di Tancredi e Clorinda (‘The Fight between Tancred and Clorinda’), one thing is certain: it’s a one-off. First presented in 1624 at a private performance before a small, presumably avant-garde audience of nobility in a Venetian palace, it was a boldly theatrical staging of 16 verses from Torquato Tasso’s crusader epic Gerusalemme liberata (‘Jerusalem liberated’), in which a fight between the Christian knight Tancredi and the Saracen warrioress Clorinda – whom Tancredi loves, but, as we are told at the outset, has mistaken for a man – ends in Clorinda’s death. Working during what were still the early years of operatic experiment, Monteverdi depicts all this in a 20-minute burst of violence and emotion for three voices, continuo and small string band in which the text is set almost entirely as recitar cantando, the style of sparsely scored, counterpoint-free heightened declamation that was one of the defining features of the early-17th-century Baroque and which made possible the creation of modern opera. But to callCombattimento a ‘miniature operatic scene’ would hardly do it justice, and would be almost as misleading as the description of ‘madrigal’ associated with it as a result of its inclusion in the composer’s eighth book of madrigals, Madrigali guerrieri et amorosi(‘Madrigals of Love and War’), published in 1638. For one thing, Monteverdi had innovations to air. As he explained in a long and detailed preface, the representation of warlike anger was one of them, expressed in the fast repeated notes and fanfare sounds he called stile concitato, a solution he had arrived at through Platonic theorising but which was dramatically effective enough to be copied by other composers. Furthermore, he used these devices not just in the sung text but also in the instruments, while other string effects include thumping pizzicati (radical for the 1620s, evoking the rain of sword blows, punches and even head-butts), the graduated trotting and cantering of Tancredi’s horse, the warily circling harmonies of the work’s opening pages, and the fp chords to suggest the dying Clorinda’s shortness of breath. Combattimento thus occupies an important place not only in the early history of dramatic music, but also in the development of expressive use of orchestral resources. Secondly, the use of pre-existing poetry rather than a text custom-made for dramatic singing offers the composer a number of challenges, resulting in quite a few oddities. The story is told almost entirely by the singing Narrator (or Testo), who represents the voice of the poet, and there are just a few short break-outs into speech for the two protagonists; only a foolhardy librettist would have allowed such an imbalance. Neither does Tasso’s solid-looking late-Renaissance ottava rima look at first like the kind of text to take wing in this urgently Baroque setting. Monteverdi turns these challenges into opportunities, however, first by making his Narrator more human even than the unfortunate combatants, wincing at the blows they land on each other, living their anger and lamenting helplessly as he watches their inexorable tragedy play itself out. And as for Tasso’s verse, it turns out that its rattling flow suits Monteverdi’s ‘modern’ music perfectly well, giving it rhythmic shape, power and – well, yes – literary class. Perhaps these unusually firm performance directions are responsible for a surprising basic uniformity of approach among modern recordings; certainly, there is not as much variety as there is in recorded versions of Orfeo and the Vespers, whose timelines show a similar pattern of slow trickle gathering momentum with the early-music revival, peaking in the early 1990s with the 350th anniversary of Monteverdi’s death, and continuing at a slightly reduced pace thereafter. Also strongly noticeable at first glance is the large spread of individual performers; only one director has recorded it twice, a mere handful of singers appear on more than one recording (only two repeating the same role), and relatively few of them are what you might call star names, in the early music world or otherwise. This, it seems, is a piece well able to protect its own identity. The Gramophone archive reveals at least eight pre-1970 recordings that haven’t made it on to CD, so the earliest in our survey is Raymond Leppard’s from 1971. It is set apart from all its successors by the use of multiple strings (English Chamber Orchestra) and a tenor leggiero of impeccable operatic pedigree, the elegant Luigi Alva, as the Narrator. Heather Harper is also there as an ample-voiced Clorinda. But if the sound world is a period piece and theconcitato sections are somewhat machine-like, it is not hard to see how Leppard’s lush but dramatically honest way with the music had won new admirers for Monteverdi in the 1960s. The 1970s was the decade of change, however. In 1975, René Clemencic used single period-strings and a recognisably ‘early music’ light tenor in Zeger Vandersteene, yet heavy rhythmic emphases and wide tempo contrasts add little to the drama beyond a certain fatalistic tread, while the editing and wallowy sound are not to be borne. Greater authority on all counts came in 1978 whenReinhard Goebel and Musica Antiqua Köln joined up with perhaps the most influential Monteverdi singer of the day, Nigel Rogers. Rogers’s strengths are his stylistic sense, flexible throat and ease with words, and the more outwardly dramatic contributions are left to an angry David Thomas and to Patrizia Kwella in a moving death scene. The string playing is agile but typically rather fussy, and probably seemed rather thin-toned to anyone who knew only Leppard or Clemencic, but this recording was the first in the intimate style we would today recognise as a norm. For the next 10 years or so Goebel’s Combattimento was a very serviceable benchmark. Nikolaus Harnoncourt’s recording from 1980 is burstingly theatrical if rather heavy-handed, with at its heart some shouty free declamation from Werner Hollweg which even breaks free of the notes at the visor-raising moment. Jean-Claude Malgoire’s Narrator, András Laczó, attempts a subtler balance of text-delivery and lyricism, but this 1986 version is underpowered, as is Nicholas McGegan’s of 1988 with Capella Savaria and a pleasingly light Narrator, Guy de Mey, who, despite offering in ‘Notte’ some of the most agile ornaments around, is often too tremulous. Roberto Gini’s first recording of the work with Ensemble Concerto (the first all-Italian one, in 1987) is confidently stylish but ultimately rather anonymous. The arrival of Anthony Rooley’s Consort of Musicke atCombattimento in 1989 as part of their complete Monteverdi madrigal cycle (begun on Decca L’Oiseau Lyre, completed on Virgin) must have raised hopes of a new version that could qualify as definitive, but for all the stylistic and vocal assurance of Emma Kirkby, Paul Agnew and Andrew King, this is a surprisingly one-paced account, hamstrung by rather static continuo playing. Kirkby’s death scene is heartbreaking, though. Several interesting new versions did appear in the early 1990s, one of the more arresting involving the combined forces of Red Byrd andPeter Holman’s Parley of Instruments, using their new set of ‘Renaissance violins’ (lighter and sweeter than the by-then-standard ‘Baroque’ ones) and a colourful continuo section (there is even a regal here). It is John Potter’s Narrator, however, who really catches the ear – with perhaps the most finely judged balance of speech and floated singing yet, as well as two of the most perfectly timed ‘ahi’ howls. This is a reading with natural ebb and flow and a convincing ‘early Baroque’ feel. With the 1993 anniversary approaching, things were hotting up. The 1991 recording by Skip Sempé and Capriccio Stravagante followed a staged production and is the boldest and most outgoing since Harnoncourt, with Verdian outpourings from Narrator Konstantinos Paliatsaras, even if the rather wet Tancredi sounds as if he would have been a pushover for the hard and hectoring Clorinda. The following year, Stephen Stubbs and Tragicomedia served up an even more imposingly operatic Verdian voice, Douglas Nasrawi, as Narrator. Yet, magnificent as he sounds, his Italian diction is sluggish and indistinct. Predictably, though, the continuo playing from this group is lively and imaginative: I liked the warmth of the organ in ‘Notte’. This performance adds a sinfonia at the beginning, perhaps to recreate something of the effect suggested by Monteverdi that the piece should surprise the listener by emerging unexpectedly straight after another madrigal. Emma Kirkby, a singer of ‘stylistic and vocal assurance’ in Monteverdi, pictured with Anthony Rooley others in ornamentation, but his Italian is quick and secure, and overall he is a commanding presence in a reading that, as you would expect from Christie, shows plenty of character and sure dramatic instinct, its flow perfectly directed, its sound heart-swellingly beautiful. Only two recordings were actually made in 1993 (therefore issued after the anniversary). Philip Pickett and the New London Consort offer a slick performance, with John Mark Ainsley a firm but lyrical Narrator. Knowing Pickett, he probably has a reason for allowing less rhythmic freedom here than there is in the previous batch of recordings, but that still means that this sounds like an essentially comfortable reading, for all the sickening pizzicato crunches of its fight scene. Pickett limits his continuo to solo harpsichord, but a more extreme stripping-down comes in the account by Marco Beasley and Diego Fasolis, which features just them – a tenor and a harpsichordist. Beasley’s intimate storytelling and folk-like style have the seductive ring of the troubadour, but the necessary rewrites to the score make this a curiosity rather than a recommendable version. Beasley returned to the piece in 2006 with ‘proper’ string accompaniment directed by Guido Morini, but without the same spark. Beasley’s performances do reflect an important new development, however: the serious arrival on the scene of Italian performers. Sadly,Sergio Vartolo’s reading is maddeningly mannered and drawn-out (taking nearly 26 minutes), but Gabriel Garrido’s 1997 version with Ensemble Elyma, extracted from a larger Tasso-based stage entertainment (therefore kitted out with an introductory sinfonia), is both more natural and more compelling, with swift, angry action and an imposing but lyrical baritone Narrator in Furio Zanasi. 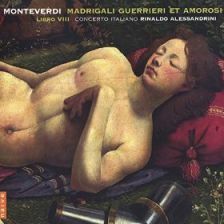 Like Rooley,Rinaldo Alessandrini came to Combattimento in 1998 in the course of a complete cycle with Concerto Italiano (the Consort of Musicke’s successors as kings of the Monteverdi madrigal). Here, too, there’s a sinfonia (by Dario Castello), leading to a reading of urgent and intelligently shaped drama, tighter and harder than Garrido’s, and with a Narrator in Roberto Abbondanza who projects strongly but stops short of the histrionics of Paliatsaras and Nasrawi, striking home all the more effectively for it. Another recording that would have attracted interest on release isRené Jacobs’s with Concerto Vocale in 2000 – a typically incident-packed and colourful interpretation in which the drama very much dictates the music’s flow. The authoritative and dark-voiced Narrator of Victor Torres and the vivid role playing of Kobie van Rensburg and Salomé Haller create a fiery, edge-of-control atmosphere that suits the warlike scene perfectly. Even without comparison with the last two, Sandro Volta’s all-Italian account would already sound weak and scrappy, and Roberto Gini’s second recording, also from 2003, accomplished but polite. More detailed is Françoise Lasserre’s loving reading from the year after, with Narrator Jan Van Elsacker relishing the tenderer moments in particular in a performance that – if not quite capturing the drama of Alessandrini or Jacobs – gathers you in its rolling momentum. Claudio Cavina’s recording with La Venexiana was another to be part of a complete madrigal cycle. With a soft-edged Narrator in Mario Cecchetti (who had sung the role for Gini the previous year), these admired Monteverdi interpreters give an individual reading in which the details are thought through and lingered over (not least the normally rapid-fire text delivery in the fight scene), resulting in a performance lasting 25 minutes. Inserting the harp solo from ‘Possente spirto’ at the start of ‘Notte’ is over-clever, though, symbolic only of the fact that this performance needs more naturalness. Then came two compelling one-offs in 2005. First, Emmanuelle Haïm wheeled in a rather big gun for her Narrator with Rolando Villazón, whose wide dynamic range, love affair with line, and verismo oomph produce results that, despite a whiff of the 19th century, can set the spine tingling. Sometimes a performance is just too splendid to resist, and this is one of them, though I do wonder if it is really true to the atmosphere of Tasso and Monteverdi’s world. Even more out on a limb, however, is Anna Caterina Antonacci’s solo account. The playing of Modo Antiquo under Federico Maria Sardelliis frankly not so exciting, but all ears will anyway be on Antonacci – dark, grand, feisty and totally inhabiting the music (she once huskily described the piece as ‘a pass-ion fight’). Like Villazón’s, this performance is somehow wrong, but also somehow so right. The 2009 account by Le Poème Harmonique is rich, agile and atmospheric, with flow between sections expertly managed byVincent Dumestre. The playing is vivid, Marc Mauillon’s Narrator is penetrating and heartfelt (if lacking the authority of some rivals), and there’s a moving swell in sound at the moment of Clorinda’s conversion. And, bringing us up to date, the most recent version of all comes from Jonathan Cohen and Arcangelo, recorded last year. James Gilchrist is not as vocally imposing or belligerent a Narrator as some others, but he does show strong commitment to text and atmosphere in an intimate emotional reading. Cohen directs with shape and careful momentum, but it’s a pity that the instruments, though well played, lack presence and attack in the church acoustic. Of the 27 recordings listed here, I can’t imagine that many will fail to take pleasure in those by Goebel, Rooley, Sempé, Stubbs, Pickett, Garrido, Lasserre, Dumestre and Cohen. Those by Holman, Haïm, Cavina and Antonacci/Sardelli have that little bit more interest, either for drama, musical flow or quirkiness, but in the end Christie, Jacobs and Alessandrini stand out for the way their ideas and performers pull together. Choosing one of these has had me wavering: sometimes I’ve favoured Christie’s fine balance of dramatic incident and musical intelligence; slightly more often I’ve weakened for Alessandrini’s bolder combination of the same attributes. Jacobs’s has kept coming back to me, however. Some may feel that it’s too colourful or tries too hard (not new criticisms of Jacobs), but it really hits home when it needs to, and as Haller draws out her long dying note, you remember Monteverdi’s description of the work’s astonished early audiences: ‘moved to such compassion that eyes were moist’. This one won’t please everyone, but, as is so often the case with Jacobs, strong ideas strongly realised really do a memorable interpretation make. In a tough field it won my vote for its moments of emotional power, successfully integrated into a coherent yet dramatically urgent whole. Roberto Abbondanza is an imposing Narrator in a finely judged balance of musical and dramatic needs. This is a bold and confident all-Italian version that, more than any, seems at ease with Monteverdi’s musico-dramatic world. If Jacobs annoys, this won’t disappoint. Nicolas Rivenq is a splendid Testo; and exuding a faultlessly managed sense of flow, Christie reminds us that when it comes to Baroque music drama his musicality, skill and understanding rarely fail him. How to buy Mahler? Get start from the top 10 essential recordings guided by Gramophone.